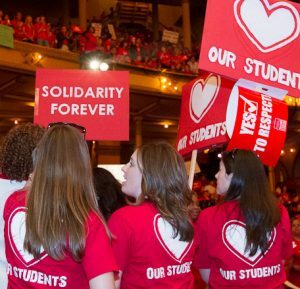 Five charter schools could strike in coming weeks, as educators battle for living wages, adequate student supports, pension rights, protections for immigrant and diverse learners. Press conference can be viewed at this link. CHICAGO—After two historic strikes against charter operators—including the first in the nation’s history last December, CTU members who work at five charter schools announced strike vote results late this afternoon at Instituto del Progreso Latino, one of the charter operators with which union members are bargaining. The five schools employ 134 CTU members who educate almost 1,800 students. 94 percent of union members voted, and of those 97 percent voted in favor of striking if there is no progress at the bargaining table. Union teachers and support staff at the schools are demanding protections for diverse learners—including protections built into the contract to provide special education students with the services they both need and are entitled to under federal law. They’re demanding more support for English language learners and immigrant students—including sanctuary protections enshrined in contract language, adequate staffing and resources for schools that have historically suffered from serious shortages of both, and equal pay for equal work with their colleagues in CPS. At one school, teachers are also battling to force the operator to contribute to their pension fund—a move opposed by the same wealthy businessman, Jim Mabie, who is trying to gut the pensions of striking Chicago Symphony Orchestra musicians. Mabie sits on both boards. Today’s press conference announcing the strike votes can be viewed at this link. Chronic under-resourcing and poor wages and working conditions drive high turnover rates at charter schools, undermining students’ educational progress and the stability and sustainability of school communities. Charter educators want to change those dynamics as part of an effort to reform the entire charter industry, which is plagued by low investment in academic programs and student supports and inflated executive salaries and management fees. IHSCA, the Instituto Health Sciences Career Academy, where the rally and strike vote results will be announced, serves more than 700 high school students. IHSCA is bargaining a joint contract with another small Instituto-controlled school, IJLA, the Instituto Justice Leadership Academy. The school serves just under 100 students aged 17-21 who previously left school and are seeking a high school diploma. Both schools are ovewhelmingly low-income and Latinx, with high percentages of limited English-speaking students. At ChiArts, more than 40 teachers are fighting for more classroom resources, from science equipment to books. They’re also trying to force management to pay into their pension fund, something that every charter operator receiving CPS funds is legally obligated to do. Management at the publicly funded selective enrollment school of 600 students has also refused to provide detailed financial information. Wealthy investment banker and ChiArts’ co-founder Jim Mabie is also treasurer of the Chicago Symphony Orchestra’s board, where he and his fellow board members are fighting to cancel the pensions of the orchestra’s striking world class musicians. At Latino Youth High School, or LYHS, the school’s employer, Pilsen Wellness Center (PWC) is insisting on a longer schol day and school year in addition to other reductions in contractual benefits, while refusing the union’s demand for equal pay for equal work, in a school whose 220 students are almost 90% Latinx and 10% Black. The school’s employer has brought in proprietary mental health services which only serve students with Medicaid and certain private health insurance plans, leaving at least 60 highly traumatized students without mental health services during the day because PWC cannot profit from servicing them. At YCLA—Youth Connection Leadership Academy—CTU members are bargaining with charter operator YCCS, which, like many operators, has larded up on executives positions while shortchanging spending on academic needs for students. YCCS pays YCLA’s CEO almost $180,000 per year and the CEO’s top deputy almost $160,000 per year, with some educators making barely a fifth of that. Management has drawn complaints that range from body-shaming to shortchanging special education students at the overwhelmingly Black, low-income school on Chicago’s South Side. Charter operator Instituto has claimed it has concerns about the validity of the strike votes at IHSCA and IJLA​. Educators have flatly rejected that claim as a smear to dodge serious resource issues the charter operator has created at the schools, and welcomed the opportunity to provide extensive documentation that would verify the legitimacy the vote. 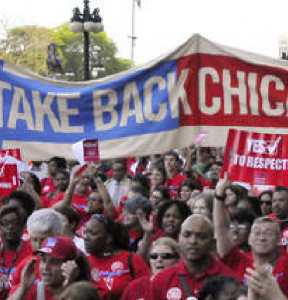 CTU members expect to set a strike date in the next two weeks.